200% up to £1200 | $2000 | €1500! Mission Month – Complete daily missions until 29th January 2017 for your share of €100,000 in prizes and tickets to daily all-in shootout freerolls. Irish Poker Open – Satellites and qualifiers running now to the 2017 Irish Poker Open. 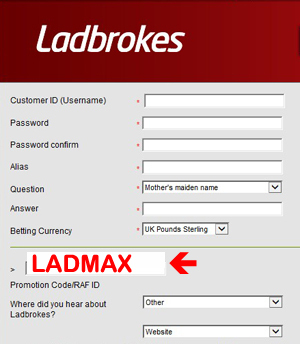 Ladbrokes new 1st deposit bonus is simple, deposit the minimum amount of £5 / €10 using the bonus code LADMAX and you will be entitled to the 200% welcome bonus up to £1200 / €1500 / $2000 – automatically. You will get a full 90 days to take full advantage of this offer. 4 x weekly €2000 New Depositors Freerolls held on Mondays at 6.30pm UK time. 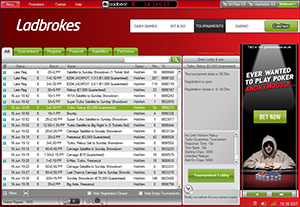 A secure, established online poker site and a household name in the UK, Ladbrokes (or Laddies) was established in 1886 with their online poker site being one of the first to go live in 2002. 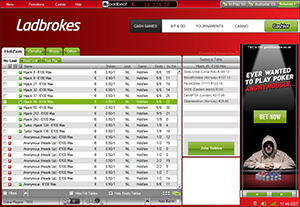 Mostly known for betting and it’s sportsbook, Ladbrokes have chosen to offer poker through the iPoker Network, they share many similarities with the network but have their own players, separate games and many exclusive features and promotions which make them appear more like an independent network. 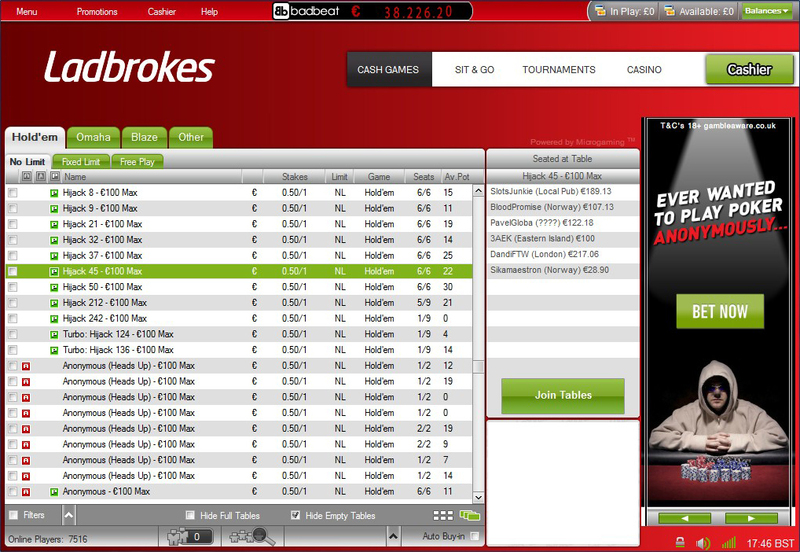 The Ladbrokes software is user friendly and stable with a few little added extras. You can play casino games, blackjack or roulette direct from your poker table, plus your Ladbrokes poker account will give you access to their other services such as casino, sportsbetting, financial betting, specials (bet on anything from elections to TV programmes) and lottos. At Ladbrokes you can hide your identity, and your playing style, with Anonymous Tables where only you will know where you’re sitting! Find anonymous tables, where all seated players will be given an anonymous alias, in the lobby under the ‘Anonymous’ button. These are becoming very popular as casual and pro players can sit side by side on an equal playing field (no data on your previous play is available so no-one has the advantage of HUD’s or a player database where your play can be analysed by sharks). Options: Anonymous, standard, Turbo, Fastfold (Blaze). With plenty of tables available at the low to medium stakes levels, texas holdem, as usual, is the game of choice at Ladbrokes. Most tables are played in €’s but there are some £’s table as well. There’s not much action at high stakes but I have seen tables running at €50 / €100 but usually at peak hours, I’ve just checked again to be sure and, at 6pm UK on a rainy Monday, there are no high stakes games running. 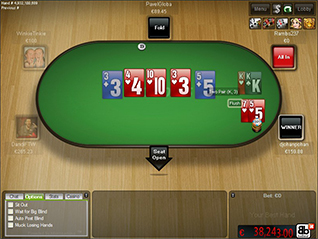 Speed Holdem is Ladbroke’s version of Fast Fold poker. A brand new way to play poker, you’ll be seated randomly before each hand therefore with each hand you will have new opponents – for even more excitement you can multi table. 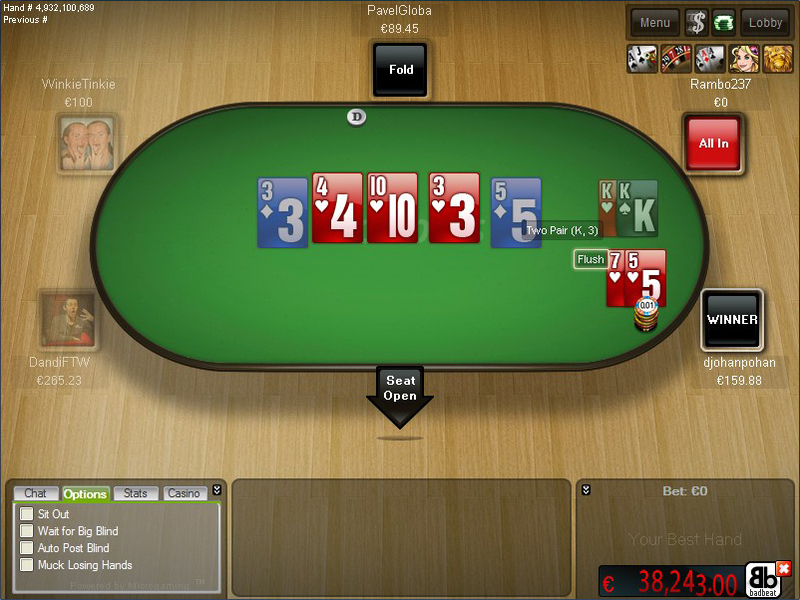 Quick fold at any time, in any position and get on with the next game. Find these games easily through the lobby on the left hand nav bar. Options: Standard, Turbo, Rebuy, Freezeout, Short Stack, Super Stack. Looking for a big guaranteed money tournaments? Then look no further than the Sunday €150k guaranteed kicking off at 6pm UK (1pm New York time), you can buy in directly for €150, or enter a satellite from as little as €0.11. 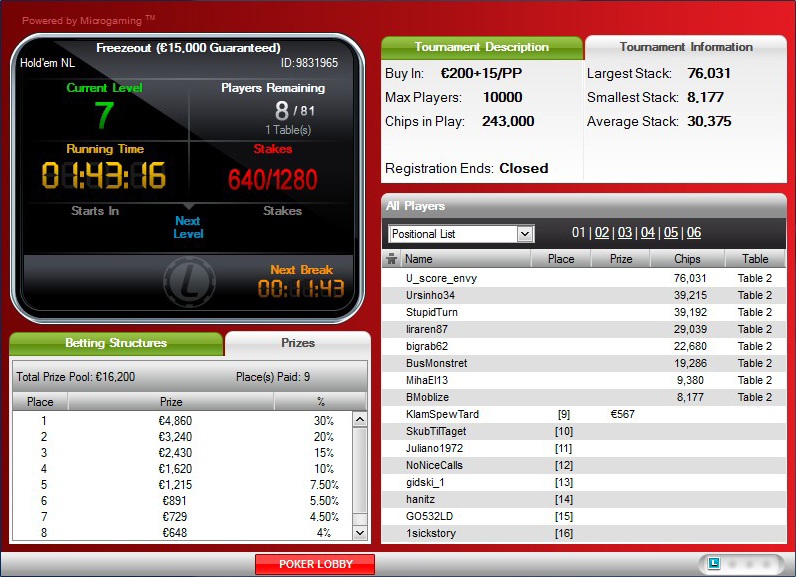 There’s also a Friday €30k guaranteed (rebuy and addon) at 8pm UK (3pm New York time), the blinds increase every 12 minutes and unlimited rebuys for the first hour of play. You can enter directly for €40 or enter by satellite for as little as €1.60. Every Saturday at 7.30pm (2.30pm New York time) you can join the €20k Guaranteed Freezeout with starting stack of 5000 chips with blinds increasing every 15 minutes. Enter directly for €30 or via a satellite from $8.80. A healthy selection of tables at low and mid stakes, mostly in €’s. Jackpot Sit n Go’s – Jackpot Sit and Go Tournaments have proved very popular over the iPoker network and, although they’re just like normal sit and go’s, they have added financial incentives. These four separate Sit and Go events are all about consecutive wins, with buy-ins to suit every budget with guaranteed jackpots. Fort Knox Jackpot – win six Fort Knox Jackpot events in a row and you’ll win €35000, finish 2nd or 3rd in six consecutive games and you’ll win €500. If the jackpot is not won in a week the prize money is increased by at least €2000. The buy in to Fort Knox is €40. Rio Jackpot – win six successive games and you are guaranteed a win of €20000, 1st or 2nd finishes x 6 in a row will make you $200. Rio increases it’s jackpot by up to €10000 weekly, if not won. Buy in €20. Maui Jackpot – This 10 seater has a €10000 minimum to be won for 5 x consecutive victories, 5 x 2nd or 3rd places will win €150. The jackpot prize grows by €5,000 in the 1st week if not won – just €5 to buy in! Dirty Dozen Jackpot – As soon as 12 players across two tables are seated the fun begins. Win four times in a row and win €2000 – all for a buy in of €2. 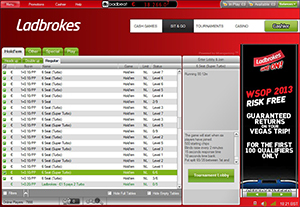 A very good loyalty programme (VIP Club) where you can exchange your Ladbrokes Status Points for cash with the new Monthly Money incentive, to enter special daily points freeroll tournaments and to purchase merchandise in the VIP Shop. With the Ladbrokes VIP Club you will be building up your points with every hand you play. 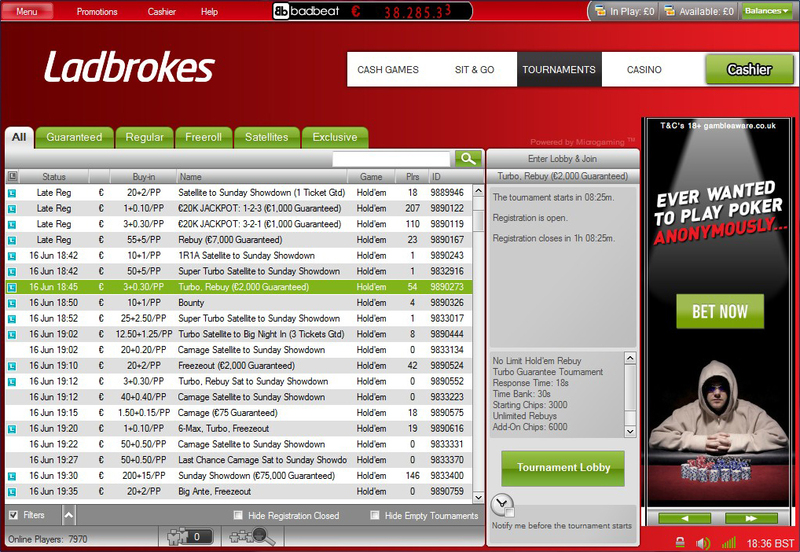 Cash games attract points at a rate of 16 Status Points for every £1 contributed to the rake or paid in tournament fees. As you generate points you’ll qualify for a VIP level, the higher the level the greater the benefits including more freerolls plus, as you climb through the six VIP levels, a multiplier will kick in to make your points grow at an even faster rate. Solid customer support by phone or email. Ladbrokes Poker last reviewed by DirectoryOnlinePoker.com April 2019. All rights reserved.